THIS year's batch of fresh graduates can expect to draw higher starting salaries, with the most lucrative jobs found in project management, according to a survey of 130 organisations. The annual survey, conducted by consulting firm Hay Group, showed that employers expect to pay new graduates 2 per cent more this year on average than they did last year. 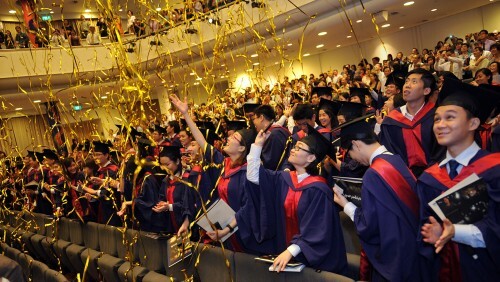 This year's average monthly starting pay for degree holders with at least second upper class honours is $2,876, compared to $2,843 last year, the survey showed. Those with second lower class honours can expect to draw an average of $2,822 this year, up from $2,776 last year. Graduates with a bachelor's degree without honours are expected to be paid $2,714 on average, up from last year's $2,688. The average starting pay for diploma holders is $1,841 per month, slightly more than last year's $1,808. The survey also revealed that jobs in project management pay fresh graduates the most, with an average starting salary of $2,906 per month for degree holders without honours. This is followed by jobs in engineering, which pay $2,885 per month, and research and development at $2,788 per month. In March, a joint Graduate Employment Survey released by the National University of Singapore, Nanyang Technological University and Singapore Management University showed that graduates who landed full-time jobs last year earned a median gross monthly salary of $3,050 - up from $3,000 in 2011. More than 9,600 respondents were polled, with lawyers, doctors and aerospace engineers among the best paid. Mr Victor Chan, regional general manager (Singapore and Asean) for productised services at Hay Group, said: "The increase in overall starting salaries for fresh graduates... also indicates a healthy demand for young talented professionals in Singapore." Mr Josh Goh, assistant director for corporate services for recruitment company The GMP Group, said employers continue to face the challenge of recruiting more Singaporeans, and "the demand for Singaporean graduates is pushing starting pay up". However, the increase is marginal, he said, adding that graduates with degrees in chemical engineering are in high demand. The Hay Group survey also indicated that employers continue to place a salary premium on first class honours degrees and master's degrees. The premium for a bachelor's degree with first class honours over an average degree is 11.5 per cent. For a master's degree, survey respondents said they are willing to pay 17 per cent more versus an average degree - a jump of 5.1 per cent over last year. The Hay Group study also showed that employers place a salary premium of 46 per cent on an average degree over a diploma.